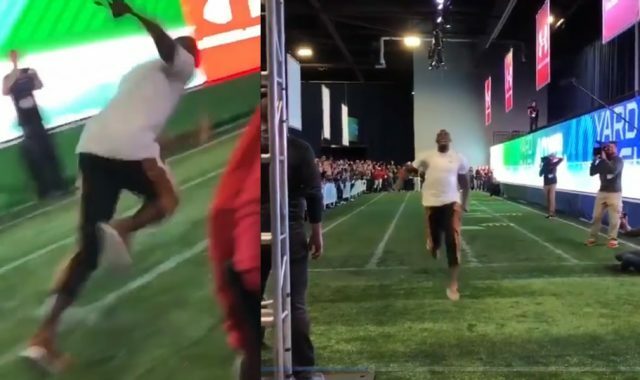 Casually competing in the event at the 2019 Super Bowl Experience in Atlanta on Saturday, the Olympic star Usain BOlt took off in sneakers and sweatpants and proceeded to tie the NFL record with a 4.22-second run. The time was unofficial, as nearby reporters noted, but the takeaway was clear: Retired or not, Bolt can still run with the best of them. The NFL record for fastest 40-yard dash belongs to Cincinnati Bengals wide receiver John Ross, who also ran it in 4.22 seconds ahead of the 2017 NFL Draft.